Union Wharf as it was when Ray was growing up. The house where he was born and raised is in the centre. His grandparents lived next door in the house framed by a brick arch. The Union Tavern is on the right. 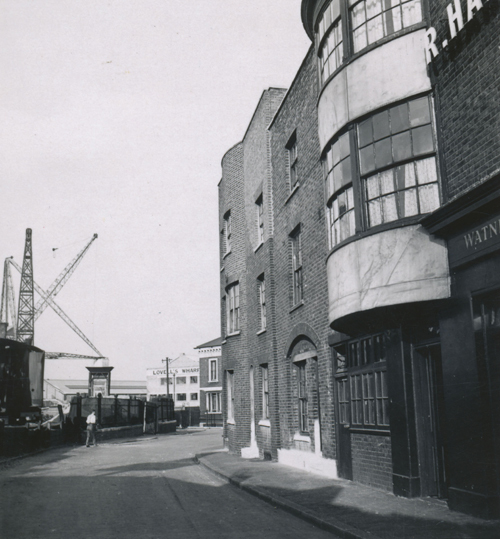 The small crane on Union Wharf, now a garden, is on the left. The cranes of Lovell's Wharf and Enderby's Wharf silhouetted against the skyline which Ray thinks is a better view than the high rise apartments that are replacing it. 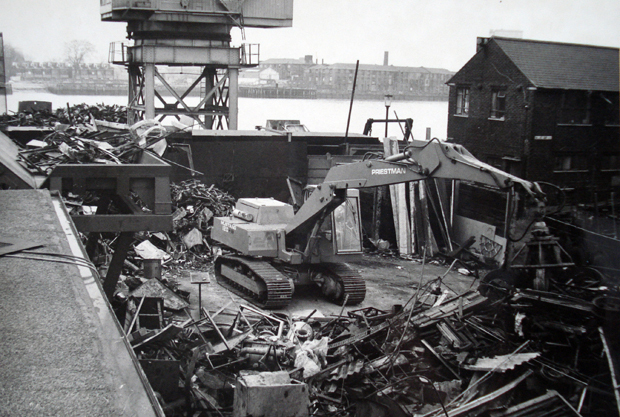 Robinson's Scrap Metal yard with the houses of Union Wharf in the background. 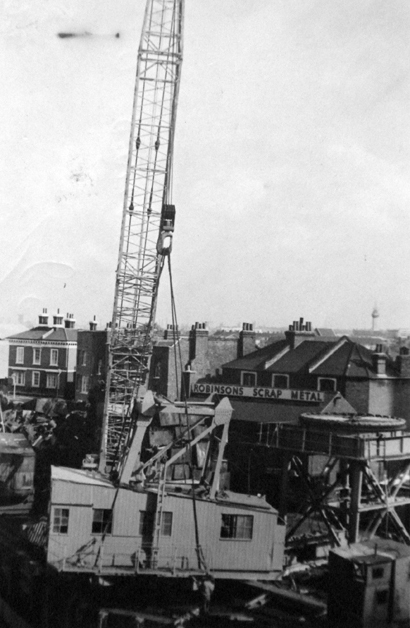 The small steam crane on Union Wharf similar in size to the crane Ray remembers operating between the power station and the coal jetty. Ray Thompson was born and bred on Ballast Quay at the time when it was known as Union Wharf and he still lives in Greenwich, managing his promotional clothing business from a design studio overlooking the Thames on Highbridge Wharf. 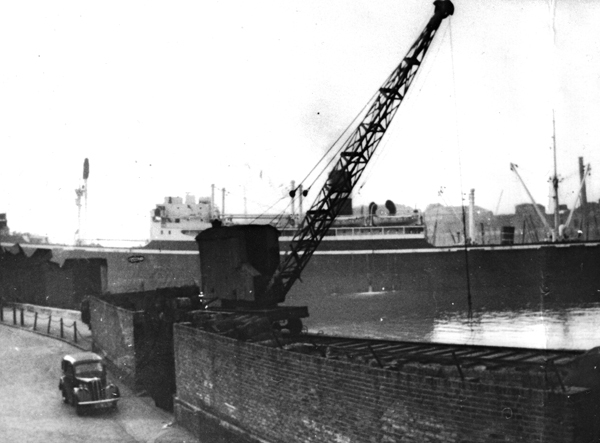 He recalls growing up next door to his grandparents in what was then considered a slum in a predominately industrial area dominated by the noise of Robinson's Iron Yard, loading and unloading scrap metal. His boyhood was spent playing along the riverfront, scrounging treats from peanut barges, and on the war damaged bomb sites in the locality. 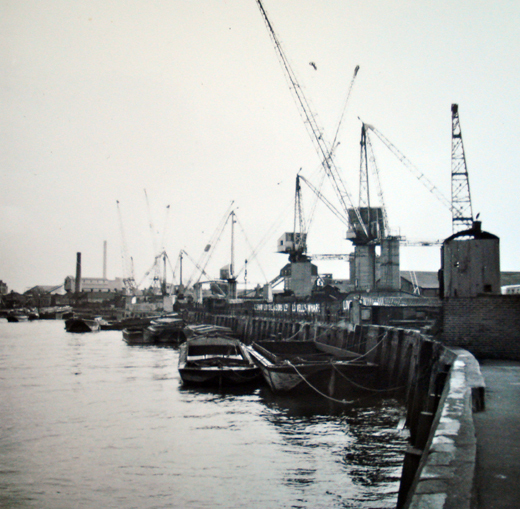 He regrets the passing of the era when the river was fringed by a forest of cranes and feels that much of the current wave of construction in the post-industrial period is destroying the heritage of this historic part of the docklands. Robinson's Scrap Metal yard where Ray's mother worked in the office (top right).